Straight out of a science fiction show? 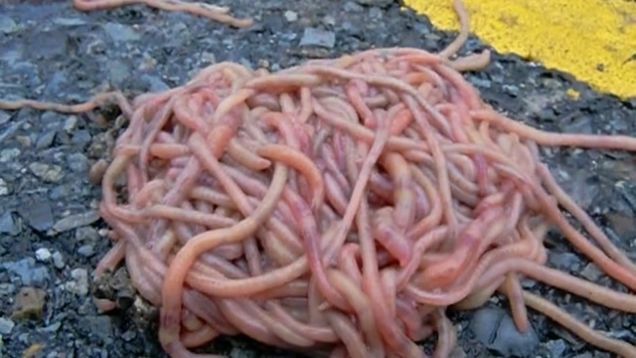 After the torrents of rain that caused the floods in Denison, Texas, folks found cylindrical piles of worms even spaced in lines in the center of roads! Local biologists are stumped by the bizarre phenomena which lasted for two days before the spaghetti like piles wiggled away. Imagine how fascinating it is that beings like worms can have these inherent instincts programed into their DNA to respond to a stimuli when the time is right. I doubt they can think through a problem, find a solution and coordinate it with the other worms - or can they? 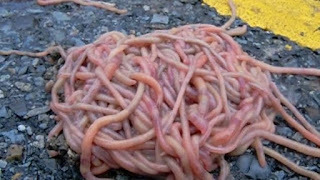 Exactly why earthworms have come to form herds is still being investigated, but it is possible that worms swarm to protect themselves. Protection from weather elements hasn't been ruled out. New research published in the journal Ethology revealed that earthworms form herds, swarming together to make "group decisions," as reported by BBC. Earthworms use touch to communicate and interact, according to scientists who performed experiments on earthworm swarms outside of soil. Research confirmed that social cues among earthworms influence behavior. According to the National Weather Service, Texas received 35 trillion gallons of rain during the month of May. Apparently that is enough water to cover the entire state in eight inches of water. The bible thumpers must have been expeting another great flood. The water caused lots of upset for displaced wildlife that are not used to treading water. Wildlife officials have been inundated with young animals that are being found by the general public that need treatment and new homes. So next time I need some worms for touting, I'll just flood the back yard instead of using a flashlight!